Wormwood, also called absinthe wormwood, is a member of the daisy family. Its botanical name is for Artemis, the Greek Goddess of the hunt, wild animals and childbirth and whose legend claims helped her own mother give birth to her twin brother, Apollo. The plant contains a chemical called thujone, an organic compound also found in conifers (i.e., juniper and cypress), oregano, tansy, sage and mugwort. Although the thujone content wormwood provided in absinthe was once credited for the liquor’s toxicity, it’s more likely that the alcohol content of the 90-to-148-proof beverage is more to blame. Still, the use of wormwood is generally limited to small quantities in herbal bitters. 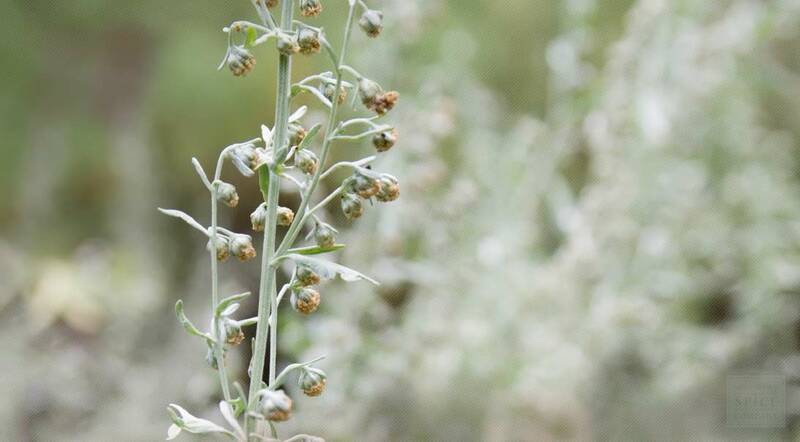 Artemisia absinthium is a herbaceous, perennial plant of the Asteraceae family. Wormwood's straight stems grow to approximately 2-4 feet in height; on rare occasion they can reach 5 feet, and more rarely still higher. They are silvery green, grooved, and branched. The plant has fibrous roots. The plant's leaves are greenish-grey on top and white underneath. They are covered with silky silvery-white trichomes, and they bear very small oil-producing glands. They are spirally arranged. The plant's basal leaves measure in length up to 25 cm long; they are bipinnate to tripinnate with long petioles, with the leaves on the stem (cauline leaves) being smaller measuring just 5–10 cm long. They are also less divided, and have short petioles (leafstalk). The plant's uppermost leaves can be both simple and sessile (without a petiole). 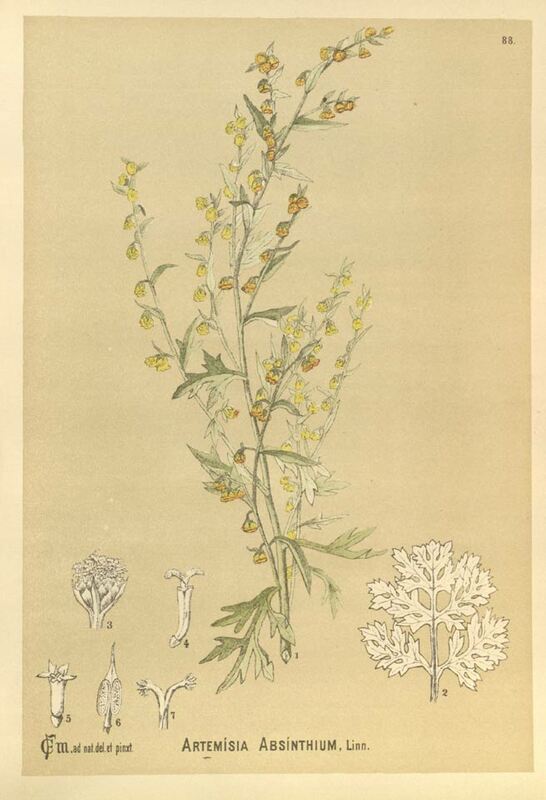 Wormwood's pale yellow flowers are tubular, and clustered in spherical bent-down heads (capitula). These are in turn clustered in branched and leafy panicles. Wormwood flowers from early summer to early autumn. The plant's fruit is a small achene. The botanical name honors the Greek Goddess of the hunt, Artemis. The common name "wormwood" comes from Middle English wormwode or wermode. Artemisia absinthium is native to temperate regions of Eurasia and Northern Africa. The wormwood plant on uncultivated, arid ground, on rocky slopes, and at the edge of footpaths and fields in sun to part sun. Succeeds in any soil. Yarrow plants are very drought tolerant. The plant is longer lived, more hardy, and even more aromatic when they are grown in a poor dry soil. Wormwood can be propagated by cuttings taken in spring or autumn in temperate climates, or by seeds in nursery beds. It also self-seeds readily. The plant is harvested as it is coming into flower and then dried for later use. Store dried wormwood herb, cut pieces and dried wormwood herb, powder in an airtight container in a cool, dry place.